There may be no sporting event where mobile apps are more essential to fans than March Madness. While most of us are stuck at work, college basketball’s most exciting and action packed moments are happening at an often furious pace. Don’t miss out! 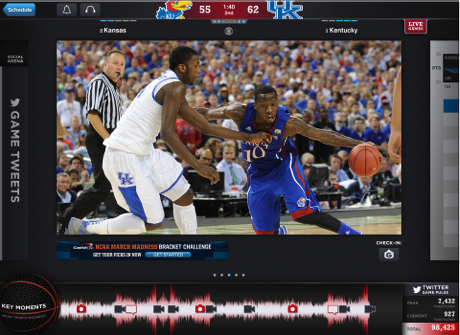 Here are the essential March Madness Mobile apps for iPhone, iPad, and Android. Naturally, you’ve got to have the March Madness Live app. With March Madness Live, you’ll be able to listen to every games live via the app, and as long as you are a cable or satellite subscriber, you’ll be able to watch all 67 NCAA Men’s Basketball tourney games live on your iPhone, iPad, or select Android devices. The app can be configured to deliver alerts for specific teams, potential upsets, games in “Crunch time” (inside 5 minutes) and Overtime games. You can also fill out your bracket and join the NCAA official Bracket Challenge. Cost: Free. This is the one app that is a must have for college basketball fans year round. From the beginning of the season through March Madness, the ESPN Bracket Bound app is loaded with college basketball content from ESPN. Videos highlights, news, schedules, rosters, and frequent updates from EPSN’s Bracketologist Joe Lunardi. Best of all? It’s free. Download ESPN Bracket Bound 2013 for iPhone from the App Store. The PocketBracket app allows you to fill out your bracket (or brackets) quickly and easily by simply taping on the team to choose the winner? Change your mind? Easy, just tap the other team. The SmartPick option allows you to pick a team in a later round and it will automatically pick them to win the previous games. For instance, if you pick Kentucky to make the Final Four, it will fill in the previous games accordingly. You can track your brackets throughout the tournament. Once the tournament begins, your bracket is scored and updated after each game. Create and join pools with one tap. From within the app, you can invite anyone to your Pool via Email, Facebook, or Twitter. iPhone: PocketBracket: Men’s College Basketball from the App Store. You can keep a pool on your device, or use private internet pools so friends can submit brackets from their devices. 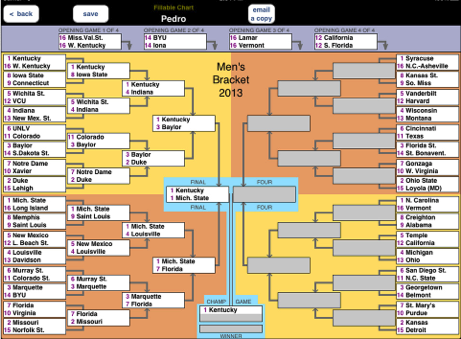 See each submitted bracket-chart with picks colored to indicate correctness. Brackets ordered with current point totals. Use either Standard-scoring or Upset-scoring which rewards picking upsets. Able to email a copy of your fillable bracket to friends. The app automatically checks for newest tourney data when re-started, and then runs super fast as a native app. Tourney final-scores automatically uploaded.